Camping in the UK is becoming more and more popular. Planning your first camping trip you might think you need loads of fancy equipment. I am here to tell you that camping for beginners in the UK is possible without spending a fortune for your first trip. Camping means you can have a holiday on a budget and a great outdoor adventure exploring our gorgeous 15 National Parks in the UK. Also included is a checklist of basic camping gear and equipment that you’ll need for your first camping trip. Plus a few of my camping tips, tricks and hacks to start you off on your outdoor adventure. What tent for your first camping trip? The first thing you think of when planning a camping trip is buying a tent. There are a lot of options out there (I have three tents and continually suffer from tent envy at campsites!) From tiny one-man expedition tents to some giant 8-man tents that seem bigger than the downstairs of my house you are spoilt for choice. How many people will be sleeping in your tent? Do you all want to sleep in the same compartment? What is the maximum number of days you’ll spend in your tent? Where will you keep all your camping equipment and personal belongings? Do you have somewhere to shelter (not in the sleeping compartment) if it rains? A family camping trip in the UK might require more space than a camping trip with friends, where you’ll probably have the tent to yourself or share your tent. Or another option borrow a tent from friends or family! So how many ‘men’ (or women) in your tent? 1-man tent, 2-man tent, 3-man tent or more. The number relates to how many people can sleep in a tent. It does NOT factor in your belongings. 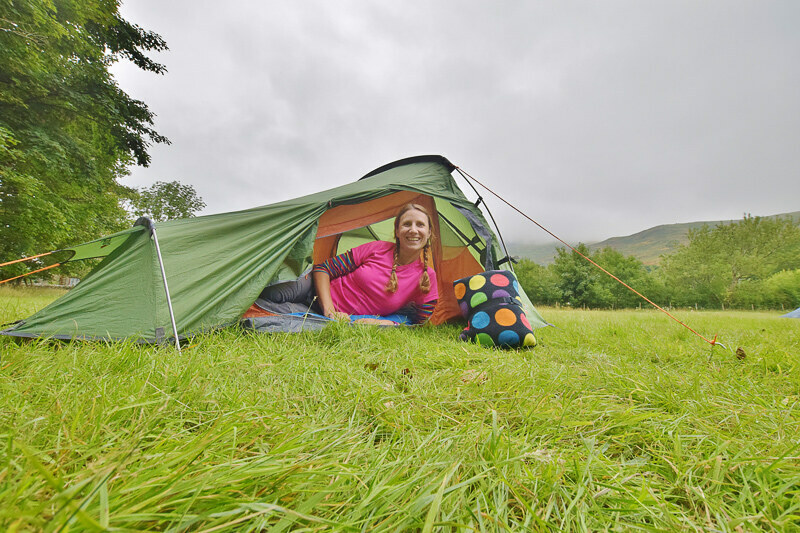 For my wild camping trips, I have a 2-man tent (Vango Banshee 200 – pictured above). This allows enough room for me to sleep, plus my rucksack and there’s even a mini porch area to keep muddy boots and cooking equipment. Breaking news (or not haha)! Just because you’re going camping doesn’t mean you have to buy a tent! If you want to try out sleeping under the stars a great option is to try out one of the many camping pods or yurts that are now available at some campsites in the UK. 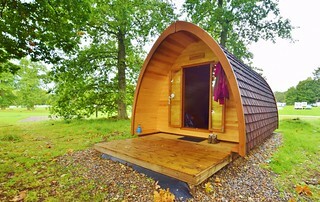 Camping pods now range from full-on luxury, like my pod at Blair Atholl campsite in the Cairngorms with a sofa bed, light and heater to a more basic pod with a roof over your head at Eskdale Campsite in the Lake District! YHA Borrowdale has some great camping pods in the Lake District too or you could try a Mongolian Yurt in the Peak District. The basic sleeping equipment is simply a sleeping bag and camping mat, maybe a pillow if you fancy some extra luxury and have space. Probably not the thing to take on a wild camping trip! Your sleeping bag should be suitable for the UK weather conditions. Generally, in the UK a 2-3 season sleeping bag is perfect for most camping trips unless you’re camping in winter! Take some VELCRO® Brand Stretch Straps to wrap your sleeping bag up in – much easier than trying to fit it into the bag, which is always too small! These come in all shapes and sizes. From the thin foam mat that gives an extra layer between you can the cold ground but not much padding, to a full inflatable mattress, with a pump! 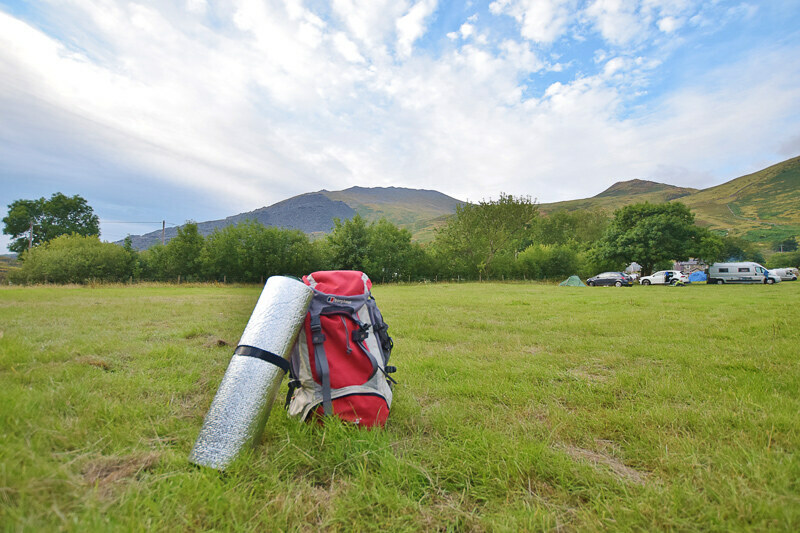 The foam mats are commonly used on outdoor expeditions and you’ll see them attached the back of rucksacks, for example on the DofE challenge! Again the VELCRO® Brand Stretch Straps are perfect to keep your mat tightly rolled up (pictured above). I personally love the Thermarest mats, they roll up small and are lightweight too, the super lightweight ones can be costly so for your first trip maybe select something that’s practical but doesn’t cost the earth! To get ready for your first camping trip in the UK, you’ll need some basic cooking equipment. Yes, I know there are fancy camping stoves with giant gas bottles but really all you need is a gas stove, gas bottles and some cooking gear (saucepan, frying pan and cooking utensils). For my wild camping trips, I take a small gas canister and attachment, easy and lightweight. But when I’m staying on a campsite in the UK I also take my small camping stove. The two together allow me to cook some delicious meals. A kettle is handy but a pan with a lid is just as good for heating water and you can use for cooking too. Dinner – do you really want to cook? Is there a local pub near your campsite #cheating haha. Don’t forget your cutlery, bowls, plates and mugs. Dig out those old plastic cups from home instead of buying new ones. A couple of water bottles are a great idea too. All campsites in the UK will have somewhere you can refill your bottles with water, saving you money and the environment! 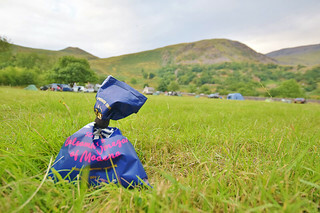 For campsite washing-up, for your first trip take the washing-up bowl from home, but don’t forget the eco-friendly washing up liquid + sponge too! These are a few things that you might already have so hopefully no extra costs but if not then they are pretty handy to have anyway! Of course, you see everyone with those fancy camping chairs, I personally like chilling out on a picnic blanket instead and much smaller to pack in your car. I also throw in a few blankets too, great for wrapping around you in the evening or an extra layer to keep you warm at night. 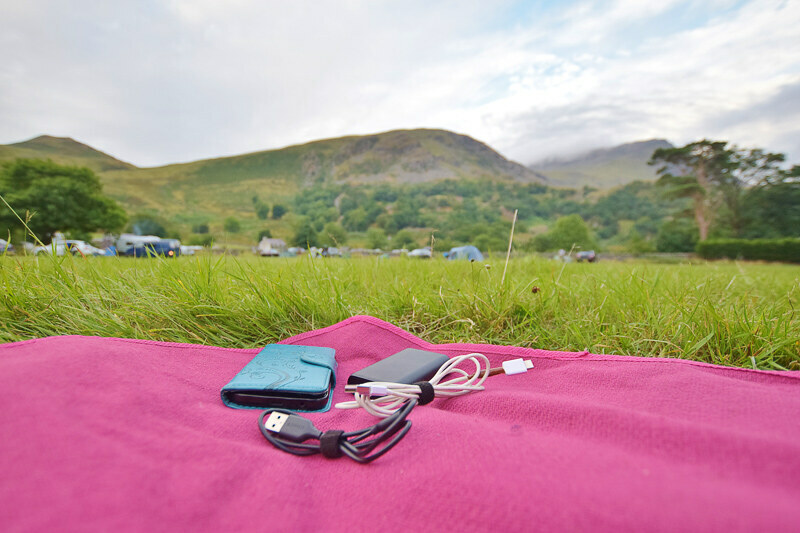 You might want a technology detox on your UK camping trip but if not then a power bank is a great way of keeping your phone and any other USB cable equipment charged. Top tip – Use VELCRO® Brand Stretch Straps to keep your camping blankets tidy and VELCRO® Brand ONE-WRAP® Reusable Ties to keep your cables organised. Are you all ready for your beginner’s camping trip in the UK now? Or do you have any more camping questions for me? Ask me anything in the comments below. This is really so helpful! I’m a complete beginner and I’m glad I have a starting point! Thanks Marty, you sound a bit like me I always wanted new camping gadgets and gear haha! Hi, this article really helpful for me. I am confused about choosing the right camping gear what would be the best for everything. But review this article my confusion is clear, Thanks. Thanks for sharing this helpful information. I’m sure most people can take notes from this article. One thing most people lack experience while camping. I have a couple of young friends that are going to get camping in UK soon. Well, this post gives me some good ideas for camping. I am so grateful I found your post, You’ve really covered up almost all the possible tips that a beginner should follow while camping. My husband and I have been thinking of going on camping soon. Actually, I got a lot of information from your blog which can help to make our camping checklist much more relaxing and enjoyable. Thanks.